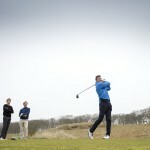 Craig Lawrie has won The North East Alliance Championship, part of the Golf Monthly final series. He joins an illustrious list of winners, including his old man Paul. I’m a day late writing my blog this week as I was visiting my dad in hospital yesterday. He’d been struggling with a bad back for a couple of weeks and things reached a head on Wednesday when it became clear it was a bit serious. He had an op yesterday on a herniated disc and is now recovering in Aberdeen Royal Infirmary. As you might imagine, he’s pretty fed up and that is, in no small part, down to the fact he will be off golf for the foreseeable future. He’s got the latest copy of Golf Monthly to keep him busy, but it won’t be long before he’s read every word and thumbed it so intensively that he risks repetitive strain injury from overly aggressive page turning. The thing is: for my dad, as it is for me, golf is an integral part of life. It’s not just a pastime or hobby, it’s pretty much all consuming. When I saw him yesterday the first thing he asked, after polishing off a large plate of mince and tatties, was “what happened in the second round of the Alliance Championship at Craibstone?” – I should point out that I also thought this was the most important news I had to give him. Well this year’s North East Alliance Championship (part of the Golf Monthly Final Series – one event left at Ellon next week) was won by Craig Lawrie, son of Golf Monthly’s new columnist Paul Lawrie. Craig fired an excellent round of five-under-par 64 at Craibstone to win by a shot from Murcar amateur Andy Campbell who had rounds of 65 and 66. Craig was presented with the Uniroyal Quaich that was first awarded in 1935 and has been won by some great players over the years including 1971 Ryder Cup team member Harry Bannerman and 1999 Open champion Paul Lawrie who won in 1989 and 1991. Andy Campbell won the trophy for leading scratch amateur, Scott Mackie won class 1 handicap and Mike Winton won class 2 handicap. Well done to all the winners. I fired a second round of 72 to go with a 66 from Inverallochy in round one. I was quite pleased except I missed short par putts on the 17th and 18th to finish with a pair of bogeys. As I walked off the final green I turned to my playing partner Jim and said, “I just know those two misses are going to cost me.” They did. I finished one behind Scott for the class 1 handicap title. So I was second scratch amateur and second handicap amateur… aarrrggghhh… Never mind, it doesn’t matter what you score, there are always silly shots you feel you’ve left out there and I’ll try to take the positives. Taking the positives is something I’ve never been very good at: in life, not just in golf. I’m so much of a glass half-empty person that a more apt description would be that I’m a: glass is very soon to be less than half empty person. Walking off the golf course I’ll never remember the striped drive or the bunker shot that came out perfectly and resulted in a crucial par save; I’ll just dwell on the putt that lipped out or the bad bounce that saw me stymied behind a tree. That’s not healthy is it? From now on I’m going to try and force myself to pick out at least three positive things from every round, no matter how bad the score is… It might take some doing… At least I don’t have a herniated disc like my old man. Get well soon dad. In this week’s golfing based anxiety dream – I did mention golf was all consuming – I was playing in the U.S. Open. I don’t’ know what course it was on, it seemed like a mish-mash with hints of Pebble Beach. Anyway, I was in contention down the stretch but found a greenside bunker at a key moment. Playing from there, I imparted so much spin on the ball that, despite it touching down by the cup, it came flying back off the green, past the edge of the bunker and out-of-bounds over a small cliff. I dropped in the hazard and made another attempt only for exactly the same thing to happen again. The third time I took slightly more sand and was relieved to see the ball land close to the hole. But then it bounded on as if striking concrete before disappearing into another bunker on the other side. At that point I woke up in a pool of sweat.